Ahmad is the celestial name of the praised one, his holiness Muhammad Mustafa, may Allah bless him with a blessing worthy of him and may our understanding be increased towards his exalted station (maqam al-mahmuda). The meaning of the name "Muhammad" is that person who is most worthy of being praised in the entire creation of Allah, the praised one. The name Ahmad means, the most praising of the Creator. 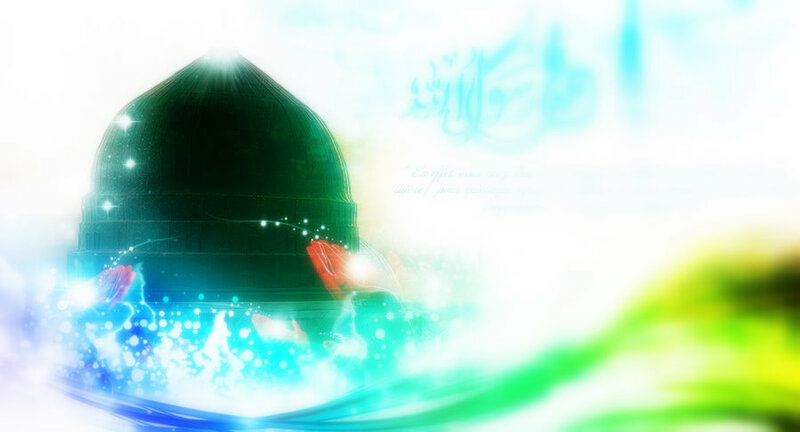 According to esoteric scholars, the name of the Prophet Muhammad was first Ahmad. Then being appointed the office of Prophethood, the creation started to praise him and he became Muhammad. The name Ahmad (also written as Ahmed) is from the Arabic triconsonantal root of H-M-D meaning highly praised, implying “one who constantly praise / glorify Allah.” In the Song of Solomon of the Bible the same root word Hebrew phrase is used in verse 5:16, “Muhammadim”, all together lovely, or the praised one. Many believe that this prophecy can be traced in the original Greek copy of the Bible where Christ’s mother tongue, Aramaic was transmitted in Koine Greek. The trace of this celestial name of the next Divine Messenger to come, the successor of Jesus is “Paraclytos” which is believed to be derived from the earlier Greek translations Periclytos. Periclytos means Ahmed, the praising one and Paraclytos means comforter, teacher, counselor etc which later got misinterpreted and mistranslated. But the earlier disciples knew this news about the next messenger to come, majority of earlier Arab Christians also receive this knowledge from Desert Father and eagerly anticipated for his coming and when Muhammad was bestowed his office of Messengership, they recognized him well and embraced his teachings. The celestial prayer form which Prophet Muhammad brought down as a Divine gift from heaven for humanity is called Salaat for the intention that with this unified prayer of the heart, connection with the Divine be established for those who does not limit themselves to this temporal world, its forms and its pre-occupations but aspire for the Kingdom to come when this reality transforms into the Greater Reality. Salaat in its unified and standard form is transmitted, taught and practiced by Prophet Muhammad for the community of believers across humanity so that all can come together to stand before their Lord in unity. Every single Muslim across the world, whether its Indonesia or Australia, whether in South Africa or Morcco, whether in Southern Spain or in North America - every muslim stands before the Lord in unity, rank upon rank to face the Lord of all Kingdoms (Rabbial Alamin) in the same manner. It is through this unified prayer form, no Muslim is ever a stranger in a mosque, regardless of whether this mosque is situated. The language is universal, the form is universal for the entire brotherhood and sisterhood. When a husband and wife is married, they can stand before God on the prayer carpet instantly and in harmony can say the prayer from their heart - because of the uniformity and unity of salaat. Thus unity is established in the family, in community, in society and ultimately in the world across communities. "It is in the process of being worshipped that God communicates His presence to men." Adam er kolobete tari Nurer roshoni. Inside the heart of Adam, behold! its the same effulgence! According to the sacred teachings of Islam, different Messengers of God hold different spiritual station with the Divine. For example, Abraham was Khalilullah, friend of God. Moses was Kalimullah, God spoke with him, Jesus was Ruhullah, Spirit and Breath of God, also Kalamullah, Word of God. And finally Muhammad was HabibAllah, Beloved of God. Such was the exalted station of Prophet Muhammad, he is known as the Father in Spirit (al-ab ar-ruhi) of Humanity, while Adam is the Father in Clay (al-ab at-tini) of Humanity . The enumeration of prophets limits itself here to the main phrase of the prophetic cycle in which the Prophet holds the first place, that of Adam. This is interpreted here as an allusion to his antecedence and to his paternity on the plane of Spirit, which coincides with the posterity of his function as Seal. Sacred tradition confirms this interpretation. That which man does not know and which he cannot come to know by himself alone is direct knowledge, revealed to the prophets and inspired to the saints. And know that the Messenger of God is among you, in you (fee kum). The Prophet is intimately present in every believer. On the macrocosmic perspective the role of the Divine Informer / Divine Messenger is to give glad tidings which is also the meaning of Gospel (good news), a role performed by Christ. Similarly for the reality that is within every single human being, on the micro scale the function of Informing or the responsibility to carry the Message is within us as well. In that sense, from microcosmic perspective, the Message is within us and hence the Messenger of God is within as well which is transmitted in the inner meanings of the Quranic verse: WaAAlamoo anna feekum rasoola Allah: "Know that the Messenger of God is among you." On the outer level the verses was revealed to teach certain decorum of conduct (adab), and at the same time on the inner level this opens up antoher vista of the Prophetic Presence within. The Second Testimony of Faith, "Muhammad Rasul Allah" according to its quintessential interpretation of Frithjof Schuon, considers the Principle only in relation to three hypostatic aspects, namely: the manifested Principle (Muhammad), the manifesting Principle (Rasul), and the Principle in itself (Allah). 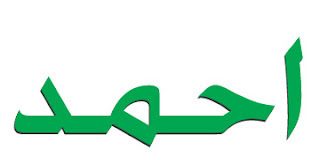 The entire accent is placed on the intermediate element, Rasul, "Messenger"; it is this element, the Logos, which links the manifested Principle to the Principle itself. The Logos is the "Spirit" Ruh of which it has been said that it is neither created nor uncreated or again that it is manifested in relation to the Principle and non-manifested or principal in relation to Manifestation. The word Rasul, "Messenger", indicates a "descent" of God towards the world; it also implies an "ascent" of man toward God. In that case of Muhammadan phenomenon, the descent is that of the Quranic Revelation (laylat al-qadr), and the ascent is that of Prophet during the "Night Journey" (layla al-mi'raj); in the human microcosm, the descent is inspiration and the ascent is aspiration; the descent is divine grace whereas the ascent is human effort, the content of which is the "remembrance of God" (dhikru 'Llah), whence the name Dhikru 'Llah give to the Prophet. Jacob's Ladder is an image of the Logos, with the angels descending and ascending. God appearing on the top of the ladder and Jacob remaining below. The three words, dhakir, dhikr, madhkur - a classic ternary in Sufism - correspond exactly to the ternary Muhammad, Rasul, Allah: Muhammad is the invoker, Rasul is the invocation, Allah the invoked. In the invocation, the invoker and invoked meet, just as Muhammad and Allah meet in Rasul or in the Risala, the Message. Thus just as Muhammad, the Messenger represent the one who invoke and Message is what is invoked or what connects us with the Divine, the same role is taken up in the salaat or heart connection prayer when one participates in it. The way and rule and manners of love is quite different than any other worldly way, rule and manners. Inner knowledge of the Path of Love tells us that we become like the one we love. Whether we do it consciously or unconsciously, the proof of love is the beloved partake into the fragrance of the lover so much so, that he or she become the goal of love. Even in the sacred tradition of Islam, God declares, "When I love my devotee, I become his hand, his feet, his eyes." Whether its a Sufi Path or any other ancient Path of the Heart, the devotional aspect has the goal of loving the bearer of Message with all its heart and soul. This is the case of the disciples of Christ, this is the case of the close companions of Buddha, this is the case of the devotee of Krishna. The follower must totally and completely fall in love with the being of the Master, so much so that the being of the Master take precedence over their own selves. And that is the whole alchemy of Love. This closeness is from the love, mahabba and ishq of the being who leads one to the Supreme Beloved. And the Sufi instruction is to love those who are loved by Allah. Here those who are loved by Allah after the Prophet and Messenger is their spiritual heirs, the saints and friends of God, the sincere ones. Now loving the Habib Allah, the Beloved of Allah means to aspire to become like the one who is loved by Allah. And Salaat is one of the principle technology by which one become like the lover of God, since every single major lover of God's devotion is encapsulated in the movement and stillness of the salaat including that of the Seal of the Prophets, Muhammad Mustafa. Below is a brief of the postures of the Salaat, which successively takes up the shape of the name of Ahmad, on the literal level, through Salaat, the devotee embodies the shape of the name. And from name the sincere ones reach the named. The Islamic ritual prayer has the embodiment of the word Ahmad in Arabic. In the beginning the servant stands facing the unified direction (qibla) and this is shape of Alef, the first letter of Arabic. Alef is the symbol of unity. Then the servant recites, “Indeed I turn my face towards the One Who is the Creator of the Heaven and Earth and indeed I am not among those who associate.” The demand of Beloved is that in the heart there remains no otherness except the Beloved. When lover sits facing the Beloved, the adab (etiquette) is to turn one’s face and whole attention to the Beloved. 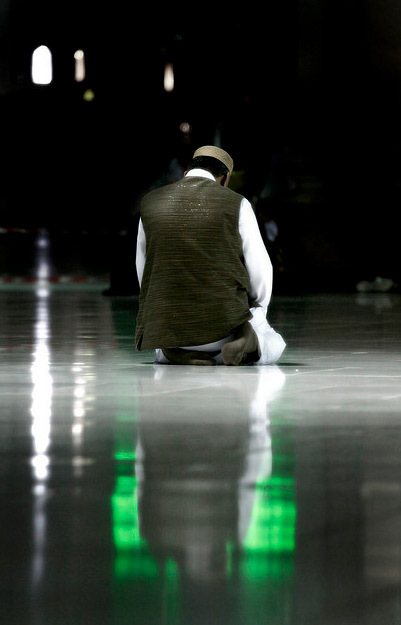 Hence the beginning of the connection (salaat) is turning the Face completely towards the Beloved by moving away from every otherness (ghayrullah). This is the stage when the devotee must know that his or her face faces the Lord. And the Lord’s glance is upon the devotee’s face. 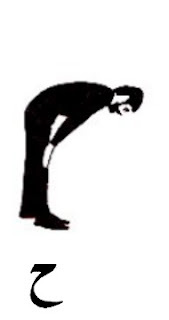 Then when the servant lowers his head and moves to bowing (ruku) in the salaat, then his posture becomes like the Arabic letter “Ha”. Then the Lord promises, “In my Kingdom all the animals from their day of creation till the last days are engaged in the remembrance and worship of their Creator. From cattle, horse, goat, cow, cat, dog, fox, elephants, lion, tiger – all these four legged animals are in perpetual bowing posture and in that they worship their Maker in their unique fashion and inspiration. The spirit of the animals will not be accountable on the Day of Judgment. I am the Creator of them all and let me announce that I am bestowing all the blessings of these creations in this very servant who is now remains in his bowing. After this comes the station of prostration. This time the servant places his forehead - the seat of his rational mind, limited logic, his vain pride, his seat of vanity that issues from his sense of self – all these he places on the ground on the unseen lotus feet of his Lord. Now the servant utters on his lips in this position, “Glory is for the Lord, the Most High” In his heart when the servant ask fervently the Lord forgives everything and dissolves every shortcoming on part of his servant who negate his ego and affirm the Highness of His Lord and glorifies Him. 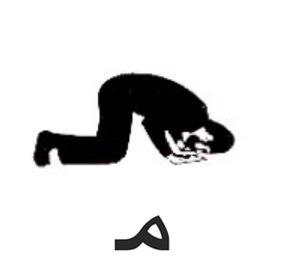 In prostration the servant’s body takes the shape of the Arabic letter “Meem” and this is the posture when the heart is above the head, which symbolizes the preference of love and devotion over ego and rational mind. Towards the end while in the sitting posture, the servant recites the greeting what was exchanged between the Lord and his Habib (beloved). During his holy ascension, when the Prophet was invited into the Supreme Presence, out of ecstasy his first utterance was, “AT-TAHI-YATU LIL-LAHI WAS-SALAWATU WAT-TAY-YIBATU” – All prayers and worship through words, action and sanctity I am presenting to the Court of Allah, they are for Allah only. In reply the Beloved greets the beloved with the greetings of peace saying, "AS-SALAMU `ALAIKA AY-YUHAN-NABIY-YU WARAHMATUL-LAHI WABARAKATUH" Peace be on you, O Prophet and Mercy of Allah and His blessings. Then the Prophet being the intercessor and mercy to all the kingdoms replied, "AS-SALAMU `ALAINA WA`ALA `IBADIL-LAHIS-SALIHIN " Peace be on us and on those who are righteous servants of Allah. And then he bear witness saying, "ASH-HADU AL-LA ILAHA IL-LAL-LAHU." I bear witness to the truth that there is no divine reality except Allah. And the Essence Itself testifies, "WA-ASH-HADU AN-NA MUHAMMADAN `ABDUHU WARASULUH" I bear witness that Muhammad is devotee and messenger. This is a reenact of the original conversation of the Messenger and Allah. In that sitting posture the Lord says, in My creation all that which calls Me, remembers Me and worship Me while sitting such as the mountain, the river, field, those animals such as snake, frog, crocodile all that worship me while sitting. Let me bestow the blessing of all these elements and animals into my servant who is now worshiping me while sitting. 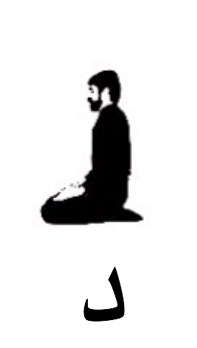 In this posture the servant takes the shape of the arabic letter “Daal”. Finally through the whole cycle of salaat, the servant takes the form of Ahmad (Ahmad in arabic) which is the celestial name of Muhammad. Ahmad means one who is praised, for indeed Lord praise such a servant who in every form of his physical body adore the Lord. He says, O all creation of my Lord, now I have come out from the Great Peace, from the Presence of the Great Peace and I am sending you peace. O friends who aspire to become the friend of the Real friend, understand the spiritual significance of the salaat which embodies the very reflection of divine praise, Ahmad and the entire creation’s worship and adoration is encapsulated in that very cycle of salaat, so take heed and learn and perform and crush your ego and fall on the ground and place your heart high, for indeed the heart is the sacred lotus seat of your Lord. May we for once at least taste the true salaat and make it our own ascension and receive the glad tidings of Janntul Ferdous, The Beautiful Garden, the choicest of reward from the Lord. Indeed according to the transmission of our master, Salaat is the key to Paradise, the blissful Presence where every lover will behold the Most Holy Countenance as clear as the full moon. My Lord has declared, “I have formed my servant in the form (surat) of Salaat. His whole body is filled with divine blessings with the inclusion of all creational forms.” Thus it is said if the entire world is sold 70 times over, even then its price cannot match the two cycles of salaat of a faithful believer (mu’min). Our Prophet has declared, for the servant, salaat is the way to attain miraaj with God, “as-salatu mi’rajul mumineen”. Through Salaat lets become like Ahmad and like Ahmad have our own ascension to the Supreme Presence, by the Presence, with the Presence and in that very Presence. Wa Allahu Hazirun! Allah is the Ever Present! Nobi mor Poroshmoni, Nobi mor Shonar khoni. Nobi naam jope jejon sheito dojahaner dhoni. My beloved Prophet is the mystical treasure. He is the real rich in the two worlds, who remembers his sanctified name.